The brass and percussion area at Washington State University offers a variety of classes and degree programs, an experienced faculty, and world-class facilities. Student groups are active throughout the region, country, and the world. The Trumpet Ensemble toured in Italy, and the Percussion Ensemble performed at regional conferences and percussion festivals. Additionally, the tuba-euphonium studio hosted the Northwest Regional Tuba-Euphonium Conference, and members of the horn studio were selected to perform at the Northwest Horn Symposium. Brass and percussion area students also participate in WSU sponsored events, including the Honor Band Festival and Jazz Festival for high school students from around the Pacific Northwest. 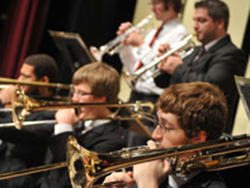 Musicians in the brass and percussion area have many performance opportunities at Washington State University. Large ensembles include the Symphony Orchestra, Wind Ensemble, Symphonic Band, Cougar Marching Band, jazz bands and combos, and chamber ensembles, including brass choir. Students are involved in collegiate chapters of the National Association for Music Education, Music Teachers National Association, International Trumpet Guild, International Horn Society, and the International Tuba-Euphonium Association. Successful upon completion of the program, graduates hold teaching posts throughout the United States, and many are employed in professional ensembles around the country. The brass and percussion faculty are in demand as performers, clinicians, and adjudicators. Many have appeared on professional recordings. Additionally, faculty compositions and arrangements are published and widely performed.